It might be hard to believe at this point, but there was a time when American Dad had some witty and fairly observant satire running underneath its over-the-top antics. From pithy jabs at the NRA and immigrant labor to full-on potshots at military torture and the waywardness of CIA "intelligence", Seth McFarlane and writers Mike Barker and Matt Weitzman armed its lunacy with a satirical edge -- not one to spark a lot of thought, of course, but enough to nod your head and grin at its use. Recently, with an apparent lack of things to say, the show's backed away from its topical content and fallen into conventional cockamamie antics that push buttons within the Smith family, amounting to both wishy-washy and moderate successes. With its sixth volume, American Dad has further slumped into a contently juvenile, forced branch-off of its sister animated sitcom, Family Guy, with less of the playful lampooning to be found that once differentiated it. It's still dependably humorous, especially a few key on-the-mark episodes, but it misfires more frequently than it should. Note: Click here for a full list of DVDTalk's American Dad reviews. The Virginia/DC-based Smith clan hasn't changed much since the show premiered, with rightist CIA agent Stan Smith (Seth McFarlane) leading the way as the conservative, patriotic husband and father. He's as narcissistic as ever, choosing his own self-serving needs long before those of his family, which makes us wonder how much those around him could really take of his often destructive shenanigans. His hollow-headed, high-volume wife Francine (Wendy Schaal) keeps on with the chores and her "beauty regiment", while the family's stay-in alien Roger dons costumes, drinks heavily, and tosses out snarky, often perverse one-liners. Like other animated sitcoms, the Smith's kids haven't really aged either: Haley's (Rachael MacFarlane) a struggling alternative tree-hugger who calls her father out on political incorrectness, while Steve (Scott Grimes) deals with being a flimsy and bespectacled pre-teen geek. 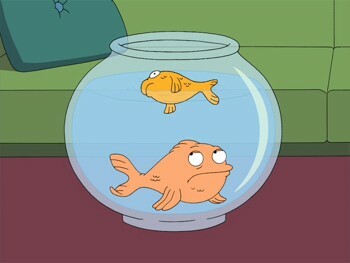 Oh, and let's not forget Klaus (Dee Bradley Baker), the German-accented talking fish. At some point, Seth McFarlane and his crew apparently got it stuck in their heads that cranking the volume up to 11 with the elements that work in the series equaled higher-quality output. In American Dad, it's now led to some rowdy, embellished weekly escapades that are a bit too impetuous for their own good, whether we're talking about Stan's damaging couldn't-care-less ego, an uptick in F-Bombs, or the show's fascination with killing birds. In moderation, they add an idiosyncratic flare; when used copiously, they come across as bludgeoning with the purpose of agitating its audience into thinking it's edgy. Some savor the nerve McFarlane and crew exhibit in sneaking this lunacy on-air, and they'll have a field day with what he gets away with -- "manually releasing" a racehorse, showing Steve getting stabbed by a homeless guy, a head exploding, necrophilia -- but American Dad often takes a few steps over the line towards plain outlandishness, all while trying to smooth everything over with the same type of "I'm sorry" redemption endings. And it just doesn't work as well this time around, but I guess it's not really supposed to. There's one overpowering impression left from this sixth volume: they've filled the gaps left by a lack of social critique with vulgarity. Neither Family Guy nor American Dad have shied away from intentional button-pushing with their content, from gross-out gags to sexual innuendos, something that the writing crew have cleverly exploited over the years. This time, however, they've recoiled further into a juvenile mindset, contorting the humor's crudeness into a strained and unfunny stream of immature gags that'd make even Mel Brooks groan. Many episodes contain the equivalent of a "stroking the salami"-level joke -- a tossed-out phrase or visual image with a perverse connotation -- then back away to reveal, you know, an actual stick of salami. You can almost hear a gaggle of pre-teens chuckling behind each punch-line, whether it's about Francine's "box" or getting a banana in someone. Maybe I'm becoming a stick in the mud, but it feels cheaper and not as self-aware when compared to previous seasons. With that said, it makes it pretty easy to distinguish what's done right in this season of American Dad, as the writers still deliver some clever and familiar belly-laughs when the episodes aren't submerged in crassness. 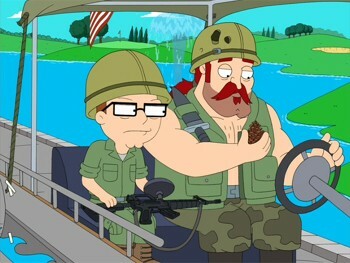 The very first episode of this season, "In Country ... Club", drops Stan and Steve in the middle of a golf course for a reenactment of the Vietnam War, which uses ceiling-fan-topped golf carts that look like helicopters and red markers as combat knives to nail some witty laughs. "Cops and Roger" dips into our friendly alien for one of his costumed outings, where he quickly turns into an amusing '80s-inspired dirty cop after going through a classic Police Academy / Rocky training montage. And there's definitely some fun to be had in "Home Adrone", a Steve-centered episode where he and his friends misread a pilot stick and screen in Stan's study as a flight simulator, when in actuality the device controls a military drone. Every season of American Dad has a pinnacle episode that stands out from the crowd, one that's either clever with its story or above-and-beyond with its humorous execution, and "Rapture's Delight" fits the bill this time around. A last-minute act of deviance on Stan and Francine's part leaves them stranded on Earth while the Rapture occurs, in which they meet Jesus -- and the earth descends into the grand battle between good versus evil. 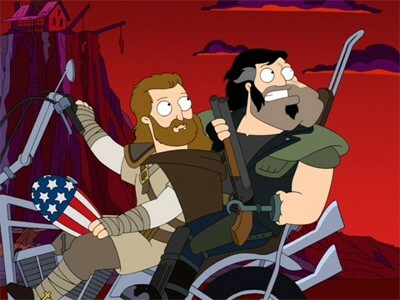 The setting in American Dad transforms from the standard Virginian suburb to a post-apocalyptic wasteland that feels straight out of a John Carpenter flick, filled with red skies, gloriously fiendish flying monsters, and a renegade, eye-scarred Stan whom Jesus enlists to do his action-packed bidding. 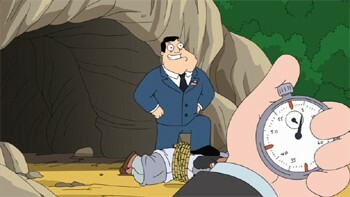 Complimented with a steady stream of neo-apocalyptic one-liners and a pretty bizarre excuse for the antichrist, it delivers the goods in a fashion that's not only head-'n-shoulders above the rest of this season, but the entire series -- and could've easily offered enough content to fill a feature-length American Dad film. Are a handful of terrific episodes and stray successful jokes enough to justify the rest of this over-the-top season? Almost, since at its foundation American Dad stays true to the characters' humor, all while still sneaking in a clever movie homage and cheeky social zinger here and there. Sure, you've got to stomach some vulgar jokes that fall flat on their faces, along with a few dud episodes -- I wasn't crazy about "My Morning Straitjacket", where Stan becomes obsessed with a rock band, or "G-String Circus" -- and a bizarre romantic arc featuring Haley and ... a talking koala. It might be the same American Dad with a largely consistent rhythm of exaggerated oddball stories dropped in the Smith family dynamic, which play with sarcastically-handled topics of slain dictators, love built on superficial things like money and beauty, and rehabilitating strippers. Yet as someone who digs the first three seasons and relished in the fifth volume's "rediscovered" quality, this season ultimately lacks the spark -- and control -- of its predecessors (but ultimately a bit better than Vol. 4). 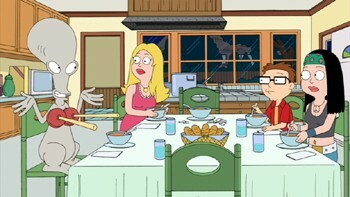 American Dad: Vol. 6 brings home all eighteen (18) episodes from the sixth volume, spread across three discs that each contain six episodes. The DVD itself comes in a three-disc clear eco-friendly case, with inner artwork offering an episode/special feature listing that annotates which episodes have uncensored content and/or commentaries. This set marks an interesting turning point with American Dad, at least with the animation: right at the center, just after "Rapture's Delight", the show transitions from the standard 4x3 framing it's always come in to 16x9 widescreen. Along with that, Fox has also taken the visual transfers to task and refined some of the issues that have plagued past releases, resulting in less jagged lines and edge enhancement. That's not to say that these issues can't still be spotted, which they can, but it's a smoother affair than previous volumes. Solid blocks of color retain their richness, never wavering or showcasing any kind of noise, while the motion-heavy scenes leave few pixels out of place. Everything here looks rather good. The Dolby Digital 5.1 tracks all stay well-balanced and clear with the vocal delivery, showing little in the way of surround dynamics but plenty of volume with the verbal clarity and musical bursts that adorn each episode. There's nothing really impressive or noteworthy to annotate here, aside from the pulsing music in "Rapture's Delight" that sounds deliciously '80s in its rhythm and snyth-heavy tones, but the volume stays well-balanced and clear throughout all of the episodes. That goes for both the rated and unrated soundtracks, where applicable. English SDH, French, and Spanish subtitles are available. All of the episodes contained here arrive with one or two Deleted Scenes, which can be viewed either on their own or in a "Play All" function in the general extras portion on each disc. Also, a little more than half (1/2) of the episodes come with the option of viewing the Original Televised Episode, which retains the beep censoring that occurred on-air when the episodes showed on Fox. Honestly, many of the episodes actually play better with the stray, grating beeps than the actual F-Bombs. However, when you pick the "Play All" option, you can only listen to the uncensored audio tracks. Also, a series of lackadaisical Commentaries adorn several of the episodes -- "In Country .. Club", "Merlot Down Dirty Shame", "My Morning Straightjacket", "Rapture's Delight" (x2), "A Jones for a Smith" (x2), "Great Space Roaster" -- most of which feature four or five writers/producers led by Matt Weitzman or Mike Barker. Where there are two commentaries, the second features The Interdisciplinary Committee for American Dad Studies. Disc Two and Disc Three contain the majority of the other supplements, with the second disc trumpeting several features on this season's big episode. Rapture's Delight: When the World Ends (9:55, 16x9) finds the writers and producers discussing various elements at-play in the episode, from the science-fiction influences and art design to the creative process in coming up with the eerie third act. Composer Walter Murphy discusses composing the music, while the rest of the creative crew dissect the distinct '80s vibe behind it all. Along with that, a rigid graphic featuring the Rapture's Delight Exclusive Comic-Con Poster can be selected, along with a full Broadcast Script for the episode. The third disc tosses on a compilation of (presumably) all the animal deaths in the American Dad universe, entitled American Dad Honors Its Four-Legged Friends (3:28, 16x9). We get it, guys: you like killing animals on the show. American Dad finds itself with less to say and more to provoke its audiences with in this sixth volume, to which the writers and producers hold onto a steady but less-effective current of overblown comedy this time around. While the entirety of this season might not be as strong and chuckle-worthy as previous ones, two stellar, riotous episodes -- "In Country ... Club" and the exceptionally-crafted "Rapture's Delight" -- nudge this volume of over-the-top Smith family debauchery to a lukewarm Recommendation. Though the rest of the season seems like it's trying a bit too hard, it makes up for it by latching firmly onto the characters' mannerisms and the solid rays of promise within a bundle of satisfying installments.